The most expensive real estate deal in the history of the United States has now turned into its largest foreclosure. 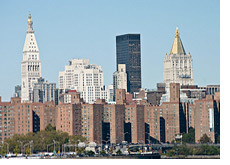 According to the New York Times (link below), Tishman Speyer Properties and BlackRock Realty have agreed to turn over Stuyvesant Town and Peter Cooper Village (two massive apartment complexes in Manhattan) over to lenders after defaulting on $3 billion dollars of debt earlier this month. The companies attempted to renegotiate the massive debt load on the properties, but those attempts proved to be futile. Tishman and BlackRock will "transfer control of the property back to CWCapital Asset Management through a deed-in-lieu of foreclosure", according to Fitch Ratings. Tishman Speyer Properties will also apparently be replaced as the management company in charge of the Stuyvesant Town/Peter Cooper Village property. The Stuyvesant Town/Peter Cooper Village property is home to "56 residential buildings", 11,500 apartments and 25,000 residents. The story here is the same as the story that has played out millions of times all across the United States over the past few years - somebody overpaid at the top of the real estate bubble and ended up giving their investment back just a short time later because they couldn't afford the payments. A group led by Tishman Speyer Properties LP purchased the massive group of apartment complexes in New York in October of 2006 for $5.4 billion dollars. The group immediately faced resistance from many of the residents of the complex, and their efforts to increase rents didn't work out as planned. A little over three years later, and the spectacular purchase made in late 2006 has turned into a catastrophic failure.